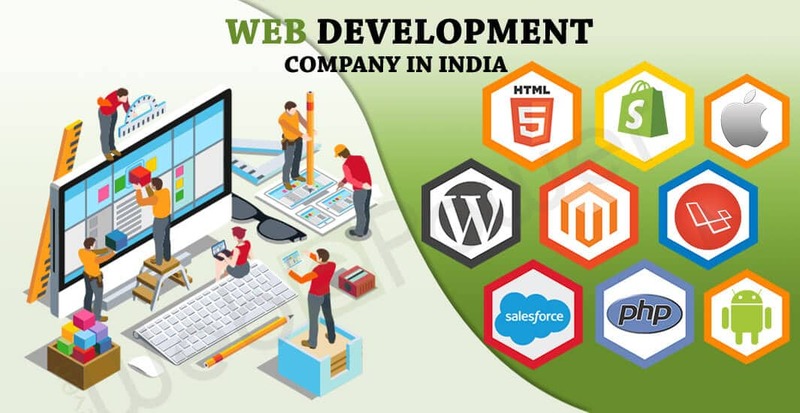 Web development is process of building and maintaining the websites, Web development company in India has the correct experience to assist technology that everyone needs. Today the web is visits daily by more than 2 billion Internet users including 40 million in France. More than 70% of households are connecting with internet, with daily use through one or more personal computers, but also via new media such as mobile phones, tablets and even televisions. The use of search engines has become largely trivialized, the web is the first database which is consulting by prospects, all age groups, in the context of a provider search and despite traditional media like the directory phone or clipboard. Therefore, a presence on the web is essential to communicate on its services, its products, its references…, in order to develop its reputation and increase its turnover. If a presence on the web is essential, it is all the more necessary to make available to the user a site with a clear and professional appearance. There are many paid or free ways to create your own website, but in most cases the final result has little efficiency compared to a site created and managed by a competent webmaster. The need to use a provider is not least especially when it comes to creating a site whose purpose is to convey a positive image and communicating. Webepower is here to enable businesses, associations, communities and other organizations to ensure an effective, relevant and profitable web presence . The realization of a site with an adaptable structure according to the medium used by the user (screens, telephone, tablet …). Web integration of your web design in HTML or PSD to Magento. Guarantee a good accessibility, an intuitive ergonomics and a natural referencing in the search engines by the respect of the W3C web standards. The accessibility of your website is closely links to the architecture of the information and other graphic elements presented. Hierarchizing web content will facilitate the reading and readability of your website. After studying your request, we offers a service whose cost is determine according to your needs and expectations, my rates being particularly suitable for small structures and launch activity. The development of a website does not stop at the design or commissioning tasks, to remain effective and competitive, it must be updating regularly. New content needs to be adding and improvements may be needs as technologies evolve. With this in mind, I propose maintenance and management contracts whose terms and conditions are set according to the characteristics of the project. For each project a back office is developed if necessary. Initial optimization (audit, recommendations and implementation of technical changes). Tracking that helps develop popularity, traffic, evaluate feedback and exchange continuously. The provision of technical assistance by providing customers with technical and functional documentation, or by monitoring and correcting problems encountered over time. The mission of our web developer is to provide the best technical support. An accomplished web development company in India truly understand the need of technical support. Autonomous: This is perhaps what earned him his reputation of a social geek. The web developer works for software development companies and sometimes alone, in front of his computer screen, from predefined specifications. Listener: This computer language specialist is also required to work in teams with other developers, the technical project manager and web designer. He must also be attentive to the expectations of the client and good pedagogue to explain why he may or may not do certain things. WebePower, a leading web development company in India, is a keen listener. Rigorous: In the Internet world, there are two profiles: the creative ones and the technicians. The web developer is in the second category. His work requires a great rigor, the slightest mistake in a line of code that can cause significant bugs, sometimes difficult to correct. Self: taught and able to adapt. As the Internet is constantly changing, the web developer must keep abreast of the latest developments so as not to be outdone and offer always cutting-edge solutions. So a web development company in India or in part of the world has to keep itself updated on the latest trends. WebePower are masters at just that. The WebePower team, through its professionalism and expertise, is able to advise and offer so many clients the appropriate and personalized options to carry out the projects. If we talk about the leading web development company in India, the name of WebePower comes to the front. A Web project is never finished and we will continue the work begun with a view to continuous improvement.